Anything Hello Kitty attracts 99.5% of young girls in Japan. Release a toy which mixes Re-ment and Hello Kitty together, is a guaranteed trip to the toy shop for any adult, if the incessant whining from a 5 year old, 'Oh, it's so cute...can I have it?' doesn't stop after 3 hours. 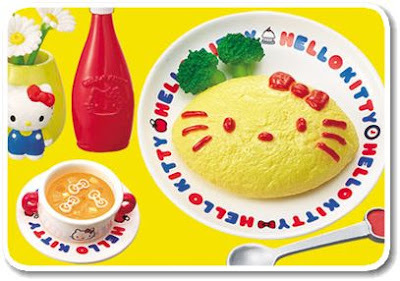 It is not surprising that the dish, 'omuraisu' sits as the centerpiece in the picture that adorns each Hello Kitty Re-ment box. What is 'omuraisu'? 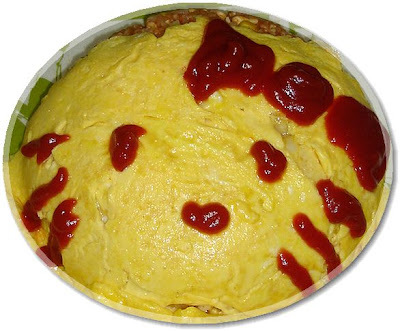 Basically a kind of tomato ketchup-tasting fried rice with omelet plopped on top. If cooked right, it is surprisingly very tasty and ultimately very popular among kids too, after curry and rice. The fun part for kids (minus the cooking) is using the ketchup to draw or doodle any picture and letting the artist inside run loose. As seen in the pictures above, Re-ment's rendition makes ketchup drawing an art! The last picture shows my finished work of art that blatantly needs more art training....maybe cooking training as well.